Parking fee is free until 1 hour. After 1 hour100yen per 30 minutes. "Hakodate Jiyuichiba" is known for being the market most professional chefs from Hakodate city go to for their supplies. It is especially renowned for its abundance of seafood produce, with many bona fide specialized ingredients on display, all of a high quality and at a good value. We run our restaurant from within this very market, "Hakodate Jiyuichiba", the best in all of Hakodate city, with all its rich varieties of high-grade fresh seafood. This allows us to supply ourselves directly from the market stalls immediately after our customers place an order. We are confident, therefore, in the great freshness of the dishes we serve. Because of Hakodate city, squid sashimi is what our customers order the most, and it is beloved both by locals and tourists alike. We also often prepare set dishes of grilled fish (such as Okhotsk atka mackerel, flatfish, righteye flounder, sablefish innards, and more). We serve many sashimi set dishes, too. I think of the seafood market stalls as our very own refrigerator. Our types of rice bowls include sea urchin eggs, salted salmon roe, and a mini rice bowl of varied seafood (3 kinds of small bowl of rice topped with sashimi[sea urchin/salmon roe/squid] and miso Soup with Crab set). These have appeared three times on national network broadcast TV. Our customers can even choose their favorite toppings (from a selection of sea urchin eggs, salted salmon roe, tuna, shrimp, Japanese scallop, squid, crab, salmon, surf clams and more) and we will prepare a custom bowl for them. Many of our tourist customers even take pictures of them. 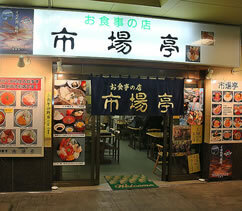 Customers who eat at our restaurant tend to visit us again whenever they come to Hakodate. We hope to continue giving it our best, and to prepare many delicious dishes made from fresh produce.